Peach BBQ Grilled Chicken - AMAZING!!! SO easy and SOOOO delicious!!! Season chicken with some store-bought BBQ seasoning and grill. Brush with an easy homemade peach BBQ sauce to finish. This is incredible!! Peach preserves, soy sauce, dry mustard, garlic, cayenne pepper, salt, and pepper. Can make the sauce ahead of time and refrigerate until ready to serve. We make this at least once a month. Everyone LOVES this easy chicken recipe. 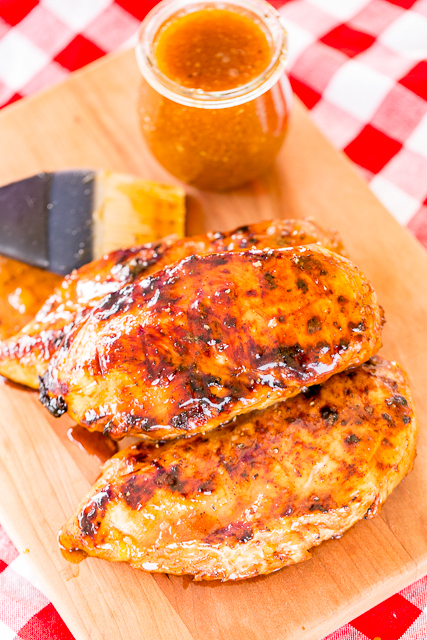 This Peach BBQ Grilled Chicken is the bomdiggity! That means really good. We both loved it!So easy and SOOOOO delicious! 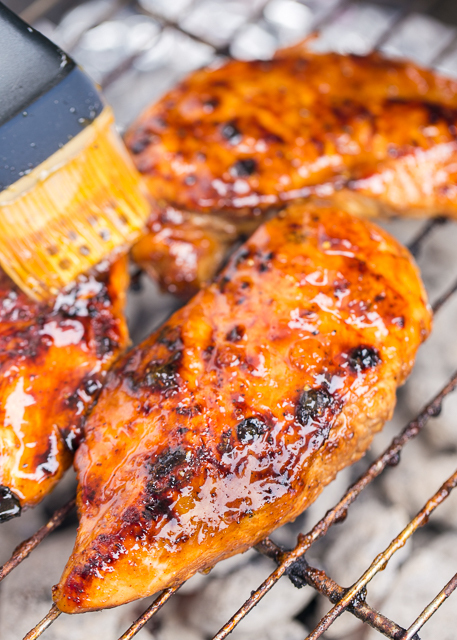 The best part about this recipe is that there is no marinating the chicken. That's right, just season it with a little BBQ seasoning and throw it right on the grill. That is, after you have pounded it to an even thickness so it will cook evenly! 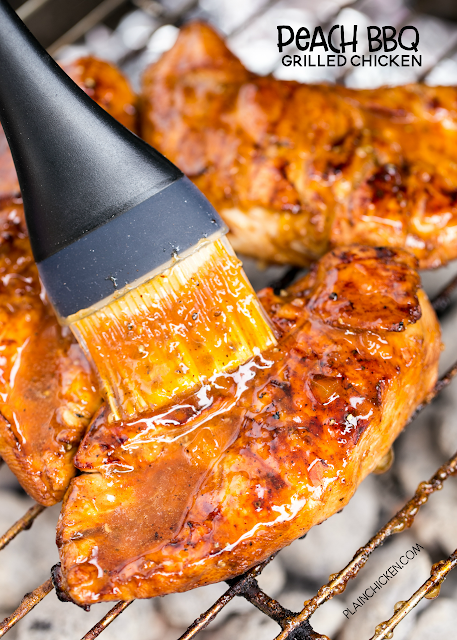 You can make the easy Peach BBQ Sauce ahead of time and refrigerate it until you are ready to grill the chicken. The sauce is also fan-freakin-tastic on the side with the cooked chicken. I like to dip my chicken into the leftover sauce. It is just so yummy!! The peach sauce is made with a jar of peach preserves. I used a jar of store-bought peach preserves, but I bet this would be even better with homemade peach preserves. If you make peach preserves, send me some! LOL! Just kidding! Really, not really. I guess I need to research how to make homemade preserves for the next time we make this chicken! Season chicken with BBQ seasoning on both sides. Whisk together peach preserves, soy sauce, dry mustard, garlic, cayenne pepper, salt and black pepper. Cook chicken on grill until almost done, approximately 6 minutes per side. Brush chicken generously on both sides with peach mixture during final minutes of cooking. Serve leftover sauce on the side with the chicken. Yum! Can you give me more details on BBQ seasoning? Brand? Floavor profile? Sorry...I just can't remember seeing anything called just BBQ seasoning. Thanks! There are several in the spice section at the grocery store. McCormick's makes one.